Cooler weather this here and I am so thankful! I love to go on evening walks…or walks in general. The hot Texas weather has been cooped up inside with my little guy most days…but not anymore! We love the fall! Two of my kiddos play softball and we love to go watch them…but to actually be able to be out and about enjoying the weather and getting exercise is what I love most! If you bought both of the above mentioned items, you would pay around $110 and get free shipping! That is a STEAL! I love eastbay.com for great deals… they have sales and coupon codes to make the deal even sweeter! 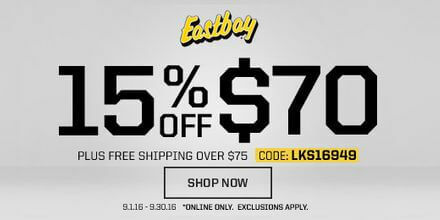 Right now you can save 15% off orders of $70+ at Eastbay! Just use coupon code: LKS16949 Expires: 9/30/16 Details: Some exclusions apply. Free shipping on orders of $75+.